The Country Under My Skin is a memoir of the Nicaraguan revolution. 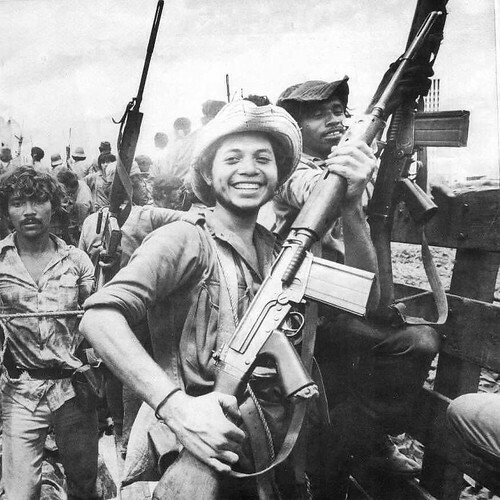 Belli grew up in a wealthy family but joined the Sandinistas, working secretly for the resistance until she had to flee the country and live in exile until the Sandinistas took power and she could return to Nicaragua. It’s not just a political memoir, though; it is also the story of her marriages and love affairs. She is clearly a remarkable woman — an award-winning poet, incidentally, as well as everything else — and it is fascinating to read an insiders view of a revolution. She became a prominent figure for the Sandinistas in a PR role, and so she met with people like Fidel Castro, and her portrayals of these powerful men are interesting as well. And it is well-written, which makes all the difference. I think it’s particularly good when it’s actually in Nicaragua: her life as a disaffected young woman who got married too young to the wrong person, the story of her political awakening, the process by which you join a clandestine organisation, and all the secret meetings and codewords and being followed by the police. Then the period is exile is rather less interesting, before it picks up again with the actual revolution and the immediate aftermath. I do have some slight reservations, though. These are mainly about her particular perspective. When I got to the end of the book, I realised that it was a book about a revolution and a war which didn’t actually feature any fighting: she was in exile during the revolution itself and she was a bureaucrat in the capital during the war against the Contras. Obviously an autobiography can only tell one person’s story, and this is hers; but it does create the image of a revolution which was all discussing ideas, giving press conferences, writing pamphlets, and delegations to foreign conferences. There is plenty of death in the book, as one after another of her friends, colleagues and lovers get killed, but it all happens offstage. Similarly, she may be passionately committed to relieving poverty in Nicaragua, but she is never poor herself and she doesn’t spend much time in contact with the poor. I don’t blame her for being from a privileged background, but it is a rather atypical perspective. At one stage when she is working with the resistance, the police clearly suspect or know that she is working for the Sandinistas, but they don’t arrest her and take her away to be tortured as they do so many other people, because, she thinks, of her wealthy family and her society connections. That’s the nature of books, though: they tend to be written by the kind of people who write books. It’s certainly worth reading, though. The Country Under My Skin is my book from Nicaragua for the Read The World challenge. » Un pueblo unido jamás será vencido! is © Burkhard Schröder and used under a CC by-nc-nd licence. Great quote! A fact worth remembering. One of my tutors at university said that they liked Malory’s Morte D’Arthur because unlike nearly every other bit of medieval literature, it wasn’t written by a bookish man: that Malory would never have written a book if he hadn’t been stuck in prison. The theory may or may not hold up, but it’s an interesting angle.